Add a unique aesthetic touch to your business' metal buildings with Metallic Products cupolas. Easy to install, fully customizable and available in both hillside curb and peak curb options, a cupola is the perfect addition to your steel structure. Add a weathervane for more character! NOTE: To submit quote request electronically, download, complete and save the form to attach in an email. The cupola's sides are constructed of 45-degree fixed-blade louvers. 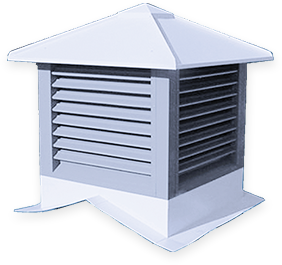 Cupolas are manufactured with an integrated roof curb. Please specify panel type and roof slope when ordering.